The last four weeks have undoubtedly been the hardest I have undertaken on this trip. For 28 days I have been outdoors subject to all the torments of the great outdoors of Australia. As I have quickly learnt it has a lot to offer in this department. First off is the wind. Now of course it is always either a cross wind or headwind, never giving a helpful push from behind. At one point I did a complete 180 only for the wind to do the same. I was raging. To add insult to injury on this instance the wind was blowing that hard it blasted my mosquito mask off my head, too far for me to catch. That was my only protection against the flies. Now why they didn’t tell me about the flies I wonder? Every waking minute that you are outside (even sometimes inside) you will have a fly on you. You have to get used to sharing your every meal with them. You even get good at telling how old the decomposing carcass that they were just dining at before deciding that landing directly on your month was a better idea. The reheated three day dead Kangaroo became a favorite. Mmmmm. When the flies finish the day shift of biting every bit of flesh they can get at the mosquito takes over the task and attack anywhere missed during the day. Quite a efficient system you must agree. The first Kangaroo I seen was alive with a spring in it’s step. But to be fair that was a rarity. Far more are to be found lying at the side of the road. The headwind always warns you of your approach as it wafted the vile smell of the decaying body directly at you until you beat the wind. The rank mass of bones and flesh is super heated each day by the desert hot temperatures. Cooking and cooling each day. The heat does the same to me. Riding in temperatures above 40c I find particularly hard (every other day nearly!). When hauling a bike the weighs in at up to 70kg not making the task any easier. When the headwind super charges the 40c heat onto my fly covered face dragging the water loaded heavy bike, well that’s me in heaven. What more could I ask for? Now as you know I ride at night. A lot of this trip has been covered during darkness. This usually isn’t a problem. But I’m in Australia so this has got to be tough too. The temperatures cool, the wind sometime drops and its easier to out ride the mosquitos. The roads empty from five cars a hour to maybe one. I am alone in a wilderness never near civilization. So passing snakes at night isn’t fun, this has happened a lot. I always wonder what happens if I got bit? A quick swerve is my best defense. But I need to see them to do this. If I did go over one I would just apply the jump on the saddle and kick the legs up tactic. This has worked effectively in other countries. The key component for the success of this move is the saddle. On one particular night ride I was positioned in the middle of the road when the world was lit up by the stadium power flood lights of an approaching road train. To my surprise directly in from of me was a monster snake taking up a lane. If the trucks lights hadn’t alerted me to it I would be been right over it. Not a problem just jump on the saddle right? Problem being at this point I didn’t have a saddle. The bolt that attached the clamp had sheared off the previous day. The near 10mm thick bolt torn completely in half. I had nothing to repair it with. I tried everything, even tent pegs. It wasn’t a great time for the duct tape to run out either. So just imagine if that truck hadn’t alerted me of the snake. I would have jumped back onto the where I would expect to find the saddle but only find a sharp seat pole. No doubt this would result in a rather girly scream, then a crash before being eaten by the snake. The 200 miles (320km) without a saddle was some challenge. All my weight was on my wrists. My right wrist had been hurt the night I hit a cow. I know who hits a cow? Well I do? Right over the top of a dead lump on the road. My front panniers came flying off and mercilessly missed the masses of cow guts. They were staying behind if they had ended mixed up in it. I never came off Kirsty instead I landed very hard on my wrist. It still hasn’t got full mobility. As for the saddle situation, this was solved by a man from Motherwell. What are the chances? No one in Aus could help but a man a few miles from my home sorted it in a few minutes. 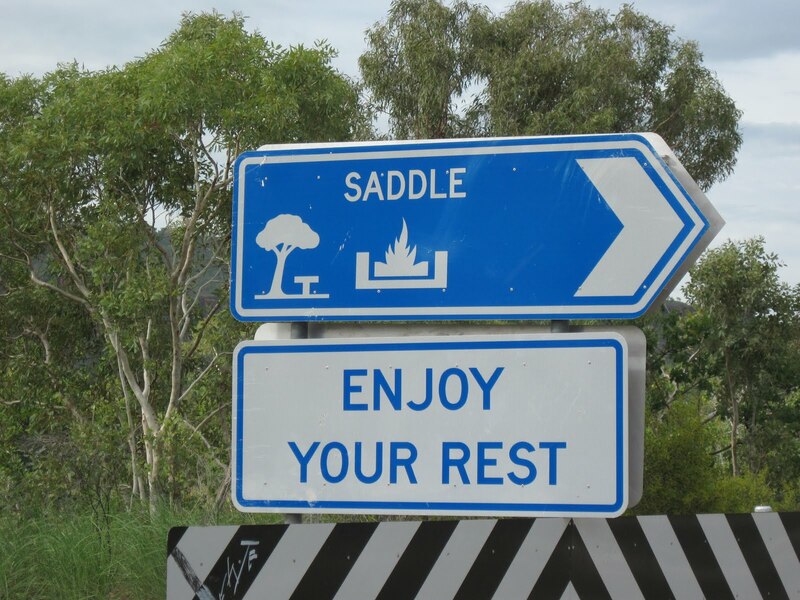 The last twist in the saddle tale does show that Australia has a sense of irony. Only some 50 miles after getting the saddle sorted I came across this rest point. Just look at its name! And enjoy a rest i did. The rest points became the ideal spots for camping. They had some shade which believe me is necessary. If you have never woken up in a pool of your own sweat you can’t say you have had a warm night. The shade helps this also and there a fewer beasties. After the night that a spider enter the tent leaving my outside it bollock naked I decided that the outback was not the safest spot to camp. I wasn’t sure how many more beating the tent would take as I tried to kill the new occupant. Anyone know anything about Spiders would this have hurt? It was with some relief that I made it to Darwin. Completing a 2500 mile (4000km) journey across Australia. For 28 days I wore the same t-shirt, same shorts and same socks. My change of clothes being naked. Maybe not the most appropriate for riding in. You know I might of got sun burnt. I was looking forward to a shower and maybe a good meal drinking cans of cold beans had become the staple. But I arrived to late. I couldn’t get a bed. My options were limited. Putting the tent up wouldn’t be safe so the old faithful, the park bench was the winner. I even managed to pick the park where all the other homeless were staying. My sense for a good bench clearly is improving. I placed Kirsty directly next to me and passed out immediately. During the night I was woken by an semi naked aboriginal man trying to take Kirsty. Not the best wake up call. I grabbed hold of Kirsty. He started asking me if I had a knife before waving his in my face. What I should of course of said was “that’s not a knife, Now Thats a knife!” – What a missed opportunity. Instead he ranted some more and charged off into the night. The ride from Perth to Darwin in Australia has been a mental challenge for all the senses. It’s been Great! or even just say hello!